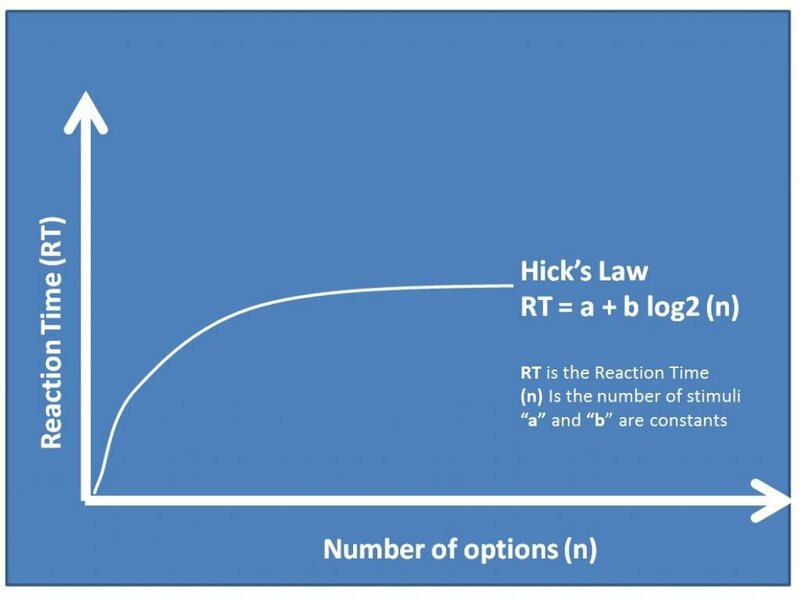 Hick’s Law is the principle that the more choices you present a user with, the longer it takes them to make a decision. The time it takes a person to make a decision increases logarithmically with the number of choices you offer them. This should provide a warning to designers and project managers not to build too much functionality into a site or application but it is often forgotten because of the desire to offer more than the competitor’s site. “RT” is the reaction time, “(n)” is the number of stimuli offered, and “a” and “b” are the unique measurable constants that depend on the task being completed and the conditions under which they are being undertaken. “A” could be getting a leaving gift for your boss and “B” could be an email chain with other members of the team to discuss what to buy them. Minimise the number of calls to action and links on each page. Follow established web conventions to allow users to learn from past experience. Avoid mission creep by adding more options and features just because you can. Focus on user behaviour and needs rather than what your competitors are doing. Use visual cues to give clear prominence to the key conversion assets. Minimise clutter to avoid cognitive strain by eliminating distractions. Hick’s Law provides scientific evidence to support well established conversion rate optimisation principles. This includes using design to minimise clutter and distractions and having a clear hierarchy of information on a page. By carefully limiting the number of options or features offered to visitors we can reduce time spent making decisions and improve overall customer satisfaction.